Soul Sacrifice feels like a game designed by somebody in a bad mood. This exclusive for Sony’s handheld is all about using your own pain—or the agony of others—for power. Grim? Sure. But, it’s also the best reason I’ve had in months to keep my Vita charged and in my bag. So, the bad mood thing: it’s the most logical conclusion I’ve been able to come to while playing this exclusive for Sony’s handheld. Soul Sacrifice feels like the design of a person annoyed at all the political correctness and hypocrisy that runs through the modern age. That person is most likely Mega Man creator Keiji Inafune, since the game is the product of his Comcept design studio. "People will prey on each other if they can get away with it," I can picture him saying. "I will make a game that revels in that truth." For something premised on such a nihilistic view on human nature, Soul Sacrifice feels damn good. Players control a trapped sorcerer who gets to relive a mysterious past thanks to a talking necromantic tome named Librom, which holds the life story of a powerful, time-lost mage. The ultimate goal of the game is to jump into that wizard’s battles and earn enough magical acumen to defeat an immortal tyrant named Magusar. Every bite-sized battle leaves you with spells, essences or items that you can fuse with each other. What you get as end-of-mission loot changes depending on the rank you earn after the fighting’s done. You’ll get to choose from melee weapons, mines, long-distance attacks and a whole lot more to take down the smaller enemies and larger Archfiends. The creature designs are truly grotesque and there’s a ton of lore—all of it embedded with cryptic hints—in Librom’s pages about the legends, beasts and lands that you’ll encounter in Soul Sacrifice, too. The game’s plot fuses slightly cheesy Evil Dead tones with a deadly serious atmosphere that keeps jostling you into a self-serving ruthlessness. You’ll periodically have to kill a partner to build up your own powers in a cursed right arm, where their knowledge, skills and personalities will still linger in your skull. It’s refreshing how Soul Sacrifice upends the typical understanding of magic-wielding protagonists. Forget noble wizards like Gandalf the Grey. These spellcasters kill wantonly, we're told, and it's probably to justify the game's mechanics. When a foe is defeated, you get a choice of Save or Sacrifice with the life energy they leave behind. The former buffs your life bar (for defense), the latter your magic reserves (for attacks). You can align your right arm to be either Divine—where it has more life energy than magic—or Dark, where it’s the opposite. You’ll be able to carve passive power-ups called sigils into your right arm and some will have increased benefit depending on whether your right arm is Dark or Divine. This constant reconfiguring of the balance between your life and magic bars—along with the mixing and matching of life essences, soul essences, sigils of multiple stripes and spell fusions—makes SS feel uniquely alive and intricate. It really feels like you’re holding the reins of a magical ecosystem in the palm of your hand. In Soul Sacrifice, spells are called Offerings (as in sacrificial offerings). They can be exhausted during a mission, meaning that you'll lose a power you love if you spam it without strategy. There can be ways to resuscitate an offering—either by sacrificing lesser foes for energy or finding places seeded with magic in the environment— but none of them are easy when you're under attack. Soul Sacrifice feels most promising in the way it lets you mix and match abilities to come up with a unique palette of attack options. You harvest magic items and mystical essences during your battles and can craft them into more powerful combinations. Players will wind up with huge inventories but Soul Sacrifice gives you some easy ways to manage all the loot. When fusing abilities, you can filter them according to their essences—whether evasive, fire/ice, health—making it easier to find the option you want among the dozens (hundreds?) of abilities. Touch input is thankfully minimal and the most significant use of it in gameplay is for the Black Rites, which are super-attacks that severely degrade your defense. The game’s arenas are bigger than you'd expect and have a nice variation of visual styles. One level looked Venetian while another places you in a ruined Baroque cathedral. Running around the arenas quickly reveals that there are pick-ups and quick-use weapons embedded into the environments, making you appreciate the aesthetics even more. These points aren’t signaled by glowing outlines either. But when you find them using the alternate Mind’s Eye viewing filter, they'll yield essential but temporary gear like fireproof armor, do things like renew spell strength or heal you back to full strength. When it comes to multiplayer, you’d have to be blind to ignore the elements of Capcom’s Monster Hunter series and the Dark Souls games floating in Soul Sacrifice's veins. 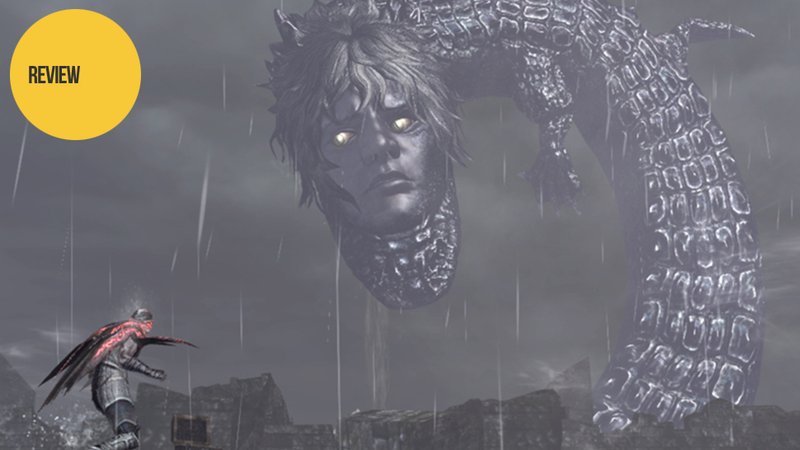 Like the former, Soul Sacrifice gathers players together to track and kill giant magical creatures and, like the latter, players can meddle with or undermine each other’s efforts. But, it’s that aforementioned ruthlessness that makes Soul Sacrifice feel like something more than an opportunistic mutation of other games’ mechanics. Sometimes, the best way to win a fight will be to sacrifice another player, whether they want it or not. They—or you—can still influence the outcome by touching the Vita screen to amp ally attacks or degrade enemy defense. Soul Sacrifice’s multiplayer is really fun, though. The experience gets doled out in short rounds but you all feel bound together by the threat of a giant boss who whupped your individual butts in single-player. Once you jump online, single-player feels like research bed for multiplayer. When you know a weakness to one of Soul Sacrifice's archfiends and can share it, that's a great feeling. And when I was downed and offered myself up for sacrifice, I swelled at being able to deliver the killing blow with my energy. It feels noble when you’re sacrificed after asking but the opposite is true when you get sacrificed after asking to be saved. Finding yourself taken out of the action unceremoniously and used for expedience makes a body feel mighty impotent. It’s critical to note that Soul Sacrfice passed the all-important commuting test, too. I was able to bang out one of the easier boss fights, sort my loot and craft new offerings/weapons during several quick subway rides during my time with the game. It’s that right-size design that makes the game feel like a great example of what the Vita is supposed to deliver: large-scale experience that you can take with you. Most mobile game experiences aren’t this involved. I can’t stop going back to Soul Sacrifice: it’s quick, it’s deep and it’s satisfying. Yes, people will stab me in the back. But even that feels oddly rewarding.